We are all getting ready for Hurricane Sandy. There may be power outage, so decided to bake something and stock up. 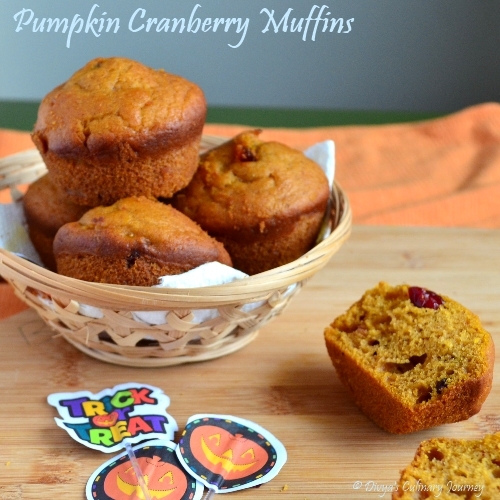 As Halloween is coming nearby, I wanted to bake something with pumpkin, So baked this Pumpkin cranberry muffins. 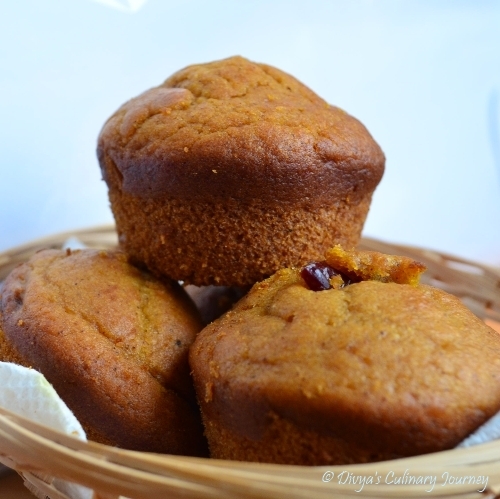 It was soft delicious and those spices in the muffin definitely brings the holiday mood. Through out the day, weather was cloudy and it was raining, so pictures are quite dull. As I am typing the storm is at its peak, so am posting this recipe in a hurry, just in case if the power supply is cut. My prayers to all those in the path of Sandy. Hope there is not much destruction. Prepare the muffin pan, by greasing and flouring them. Alternatively you can use muffin liners too. Combine the Flour, baking soda, baking powder, salt, ground cinnamon, nutmeg and ginger and set them aside. In another bowl, combine pumpkin puree, oil, yogurt, sugar and mix them well. Beat in eggs one by one and mix them well. Add this mixture to the flour mixture and mix them well, then add dried cranberries and mix well, till they are fully incorporated. Pour the muffin batter to the prepared muffin pan and bake for 15- 18 minutes till the tooth pick inserted comes out clean. Store them in air tight container and Enjoy!! It yields 18 regular sized muffins. Instead of using all these 3 ground spices(cinnamon, nutmeg, ginger), you can use a teaspoon of pumpkin pie spice. The timing taken for baking varies with oven to oven. Take care not to over bake the muffins. 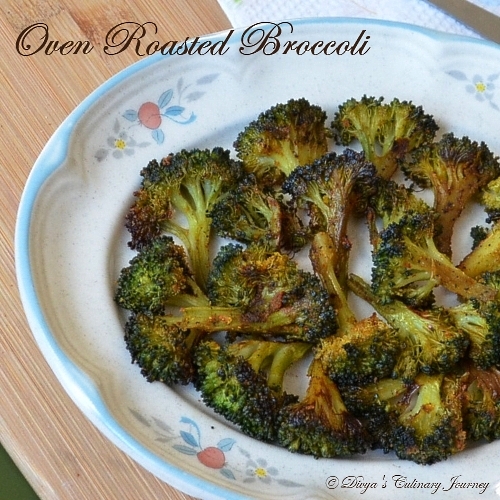 Today's recipe is Oven Roasted Broccoli made in Indian style. 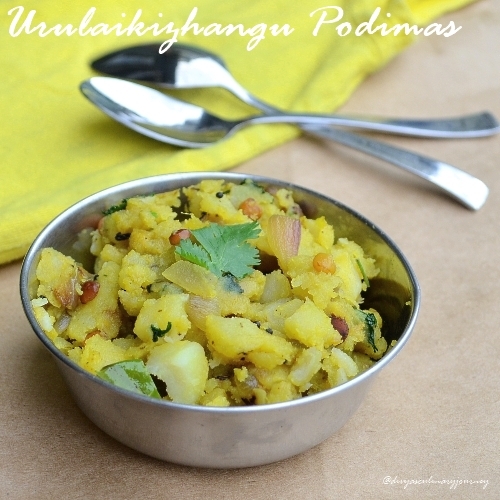 I was not in a mood to cook an elaborate meal, but wanted to cook a simple and healthy side dish which involves less work. So decided to make oven roasted Broccoli in Indian style. Washed, cut the broccoli and tossed with few spices, kept in the oven, turned on the timer and went to do other chores. It was ready without having to stand in front of the stove. 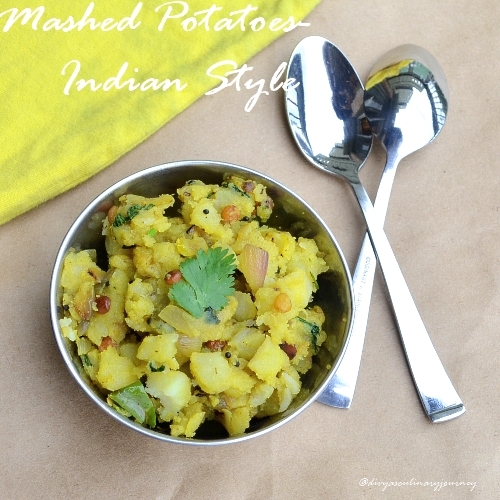 Simple and easy yet a healthy and delicious side dish. 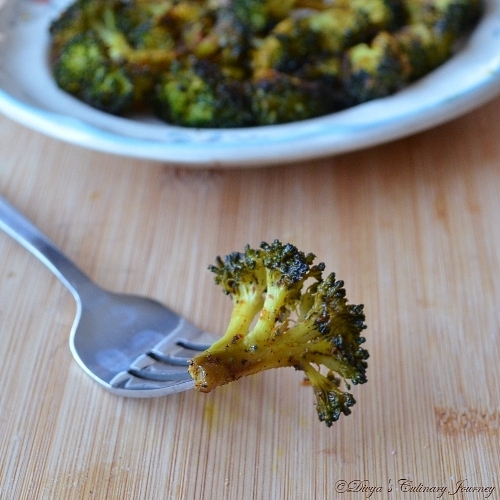 Wash and cut the broccoli into small florets. Drain the excess water and dry them thoroughly. Mix the oil, chilli, pepper & turmeric powders along with ginger garlic paste and salt. Toss the broccoli well in this mixture such that all the florets are coated well. Take a cookie sheet, line it with aluminium foil, then grease with few drops of oil. 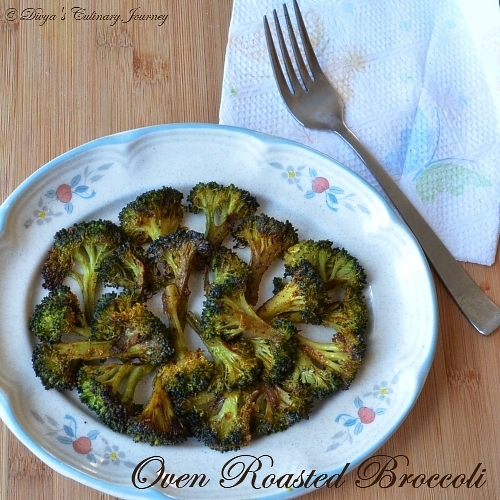 Arrange the broccoli in the sheet and roast in the oven for 15 minutes. Then take the sheet out, gently toss the broccoli and bake for another 10 minutes. Now it is crispy and slightly browned on the edges. It is ready to serve. If you want the broccoli to be crisp, then after washing, pat them dry thoroughly. Also while arranging the broccoli, don't pile them up one above the other. It is Halloween time of the year. 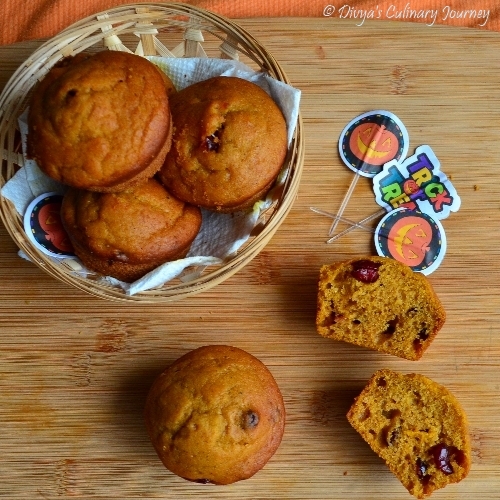 Everywhere in the blog o sphere there are dishes with pumpkin. 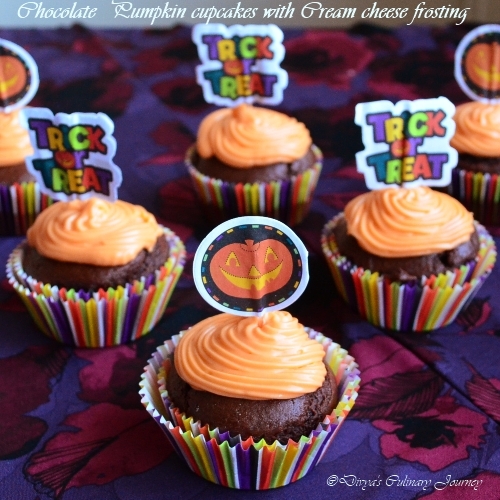 I wanted to bake a egg-less cupcake, and baked this chocolate pumpkin cupcake with cream cheese frosting. The cake was soft , chocolate'y and not overly sweet. Perfect combination!! 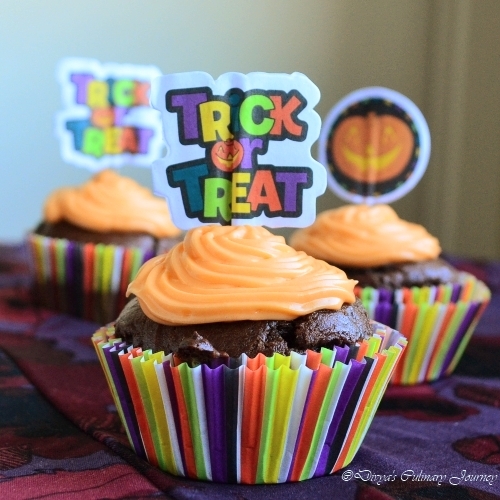 Prepare the cupcake pan by using cupcake liners. Sift together flour, cocoa powder, cinnamon powder, baking powder, baking soda and salt together. Mix the yogurt, sugar and oil together till they are well blended. Then add vanilla extract and mix well. 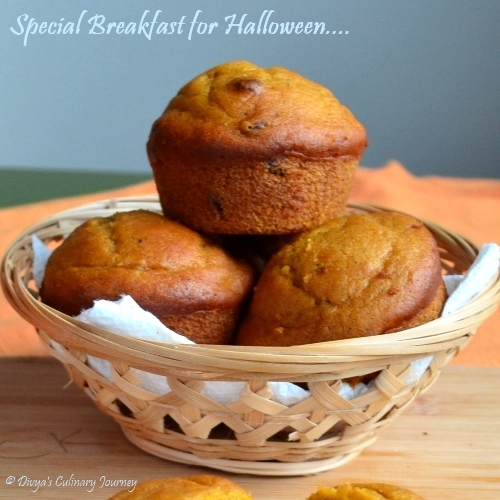 Now add the pumpkin puree and mix till they are fully incorporated. Finally add 1/4 cup of milk and mix well. Pour this batter to the prepared cupcake pan and bake for 18-20 minutes till the fork inserted in the centre comes out clean. With a electric mixer, mix well cream cheese, butter and vanilla extract. As mixing keep adding the powdered sugar little by little till all the powdered sugar is incorporated and it is smooth. Let the frosting sit in the fridge for half an hour to one hour, then start frosting. Let the cupcakes cool completely, before applying the frosting. Fill the frosting bags and apply the frosting as desired. 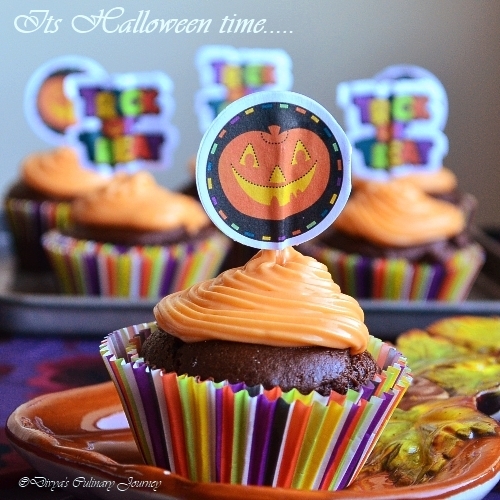 Cupcakes are ready to enjoy! The cupcakes tastes better when they are completely cooled. So have patience. I got around 10 cupcakes. 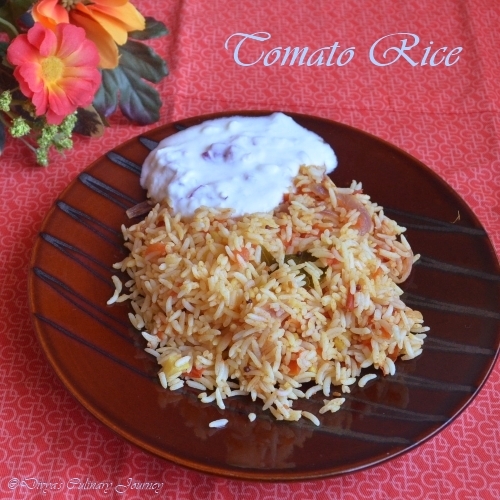 Today's Recipe is Tomato Rice. There are 2 ways to make a tomato rice. One cook rice with tomato and the other one is make rice and make chutney separately and mix them together. If I have less time and on a time crunch usually make it together. Otherwise if planning a somewhat elaborate menu, then will make rice and chutney separately and mix them. Now a days am on a spree to cook in Microwave. Cooked both rice and chutney in microwave and mixed them and served it with onion raitha. Simple lunch. Heat oil in a microwave safe bowl for a minute. Then add mustard seeds and microwave for another minute. Then add chopped onions, slit green chillies, chopped garlic and a sprig of curry leaves and microwave for 2 minutes. 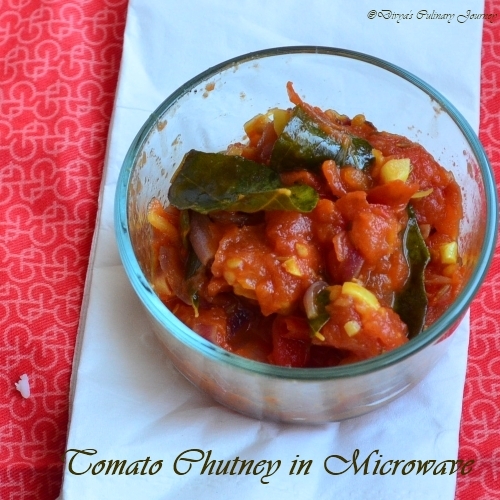 Then add the chopped tomatoes, turmeric powder, asafoetida and mix well.Then microwave for 5 minutes covered. Then add salt to taste mix well and then microwave for another 3 minutes. Now check the consistency of chutney. 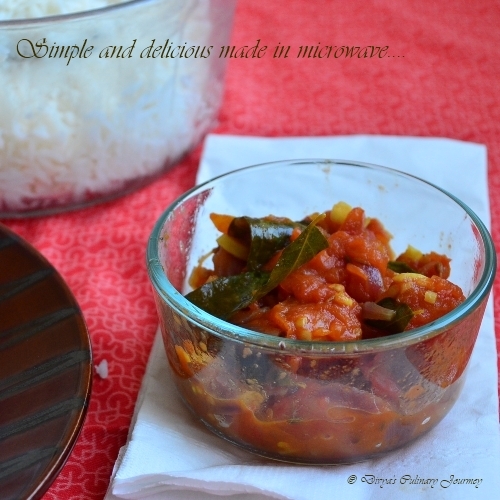 Till u get the desired consistency microwave at equal intervals of 2 minutes take out and check. When the water is all evaporated and the tomatoes are all soft and mushy the chutney is ready. 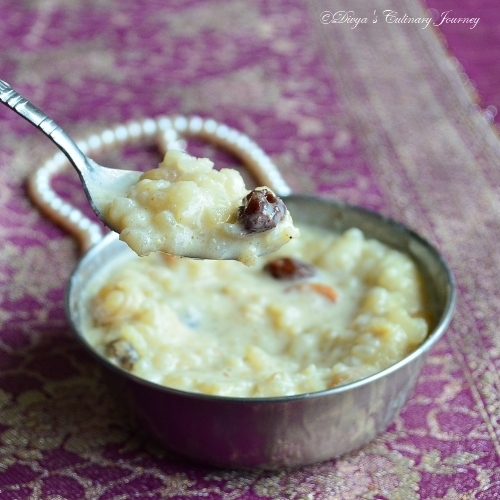 Add the chutney to the rice and mix well without any lumps. Then check and adjust the salt. Mix well. 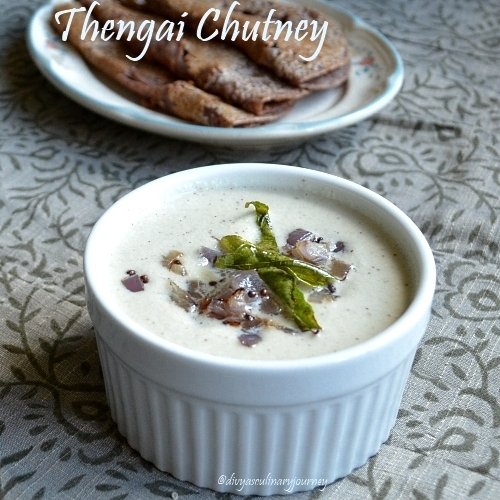 The chutney can be used as a side dish for chappathi too. The type of tomatoes, determine the time of cooking. Also cooking time in each microwave varies. Mine took totally 14 minutes from the beginning till the end. 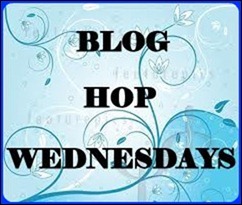 For this month's Blog Hop Wednesday, I am paired with Surabhi Nayak. She has a wonderful space with some cool recipes. 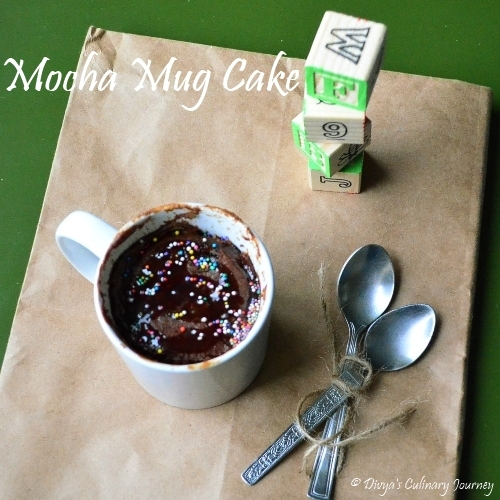 I was most attracted by her Mocha Mug Cake. 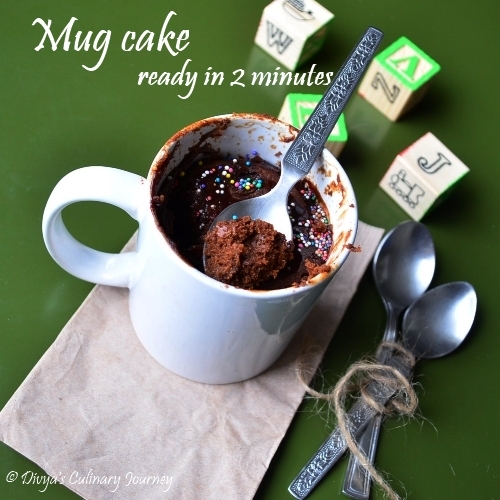 It is a chocolate and coffee combination and also I love Mug cakes, they are easy to make and can satisfy your cravings instantly. 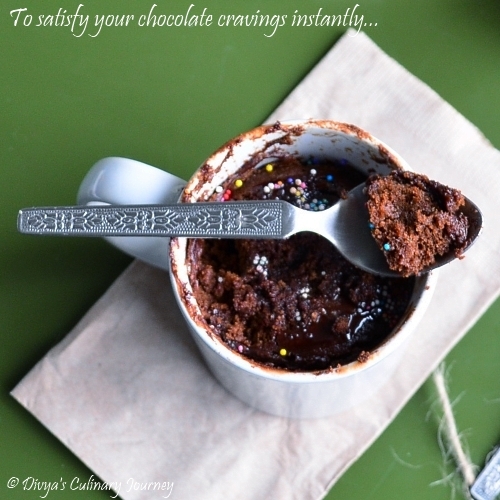 Earlier I have posted a Chocolate Mug Cake. 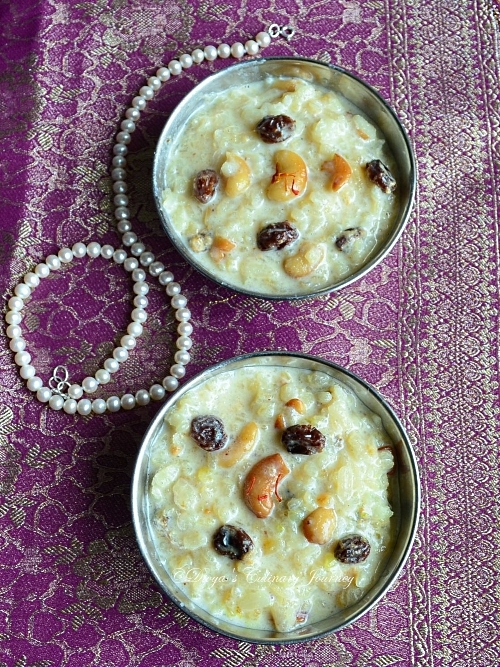 Surabhi had posted the recipe with egg, but I wanted to try it without egg and also tweaked it a little bit to suit our tastes. Yum!! The cake came out soft and delicious. I served it with chocolate syrup and added sprinkles too. First combine flour, cocoa powder, coffee powder, sugar, salt , baking soda and baking powder. Then add milk, yogurt, oil and vanilla extract and mix well. Pour this into a greased mug and microwave for 2 minutes. Cake is ready. 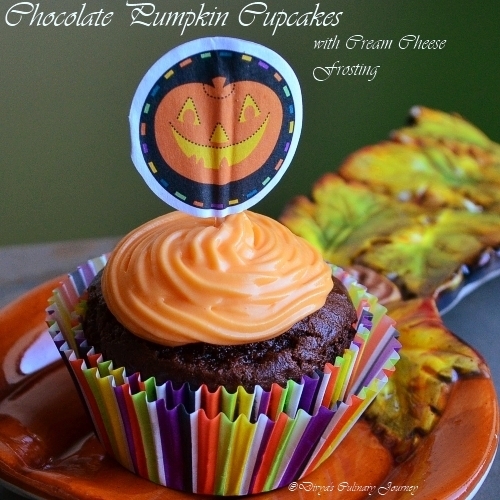 Drizzle some chocolate syrup add some sugar sprinkles and enjoy. You can use the mug itself to mix and microwave. (One less bowl to clean). But make sure it is mixed well. It you don't want the coffee flavor to be strong, adjust the coffee powder accordingly. Also this is mildly sweet cake. You can adjust the sweetness as per your taste. Time in the microwave for the cake to be done, varies with each microwave. Mine was done in less than 2 minutes. So keep your eye on the microwave when it is close to 1.30 minutes. Only when taken out in the right time, the cake will be soft.Over done cakes are dry. So watch out. Microwave in my kitchen is more of a accessory or a show piece than a appliance. I hardly use it for cooking. I use it for heating or making desserts once in a blue moon. One day my brother asked about cooking in microwave and some recipes to cook, that is when I realized I am yet to explore that area. So decided to start with the basics. 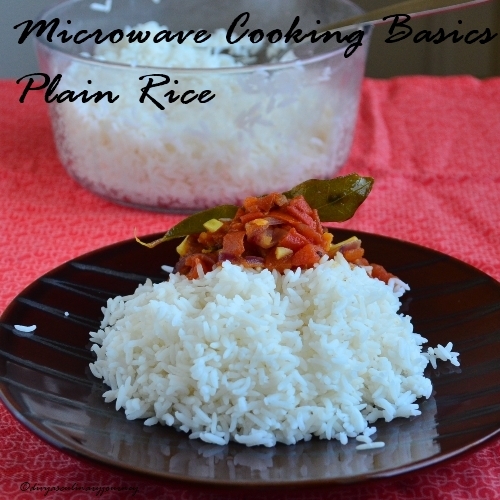 Today's recipe is the plain rice. 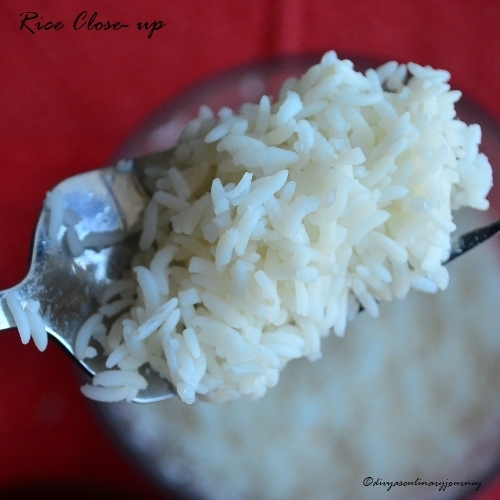 Wash the rice and drain excess water. In a microwave safe bowl, Soak the washed rice with required water(2.5 cup) for 30 minutes. Microwave them for 5 minutes uncovered. Then cover it and microwave for 12 minutes.Water will start bubbling and to avoid splatters keep it covered, but make sure there is vent for the steam to escape. Once it is done, let it sit for 5 minutes then fluff it up and serve. If there is water still left, microwave again for another 2 minutes. I used sona masoori. Type of rice determines the water-rice ratio. Also if you need the rice to be mushy, increase the water and also adjust the timing accordingly. But however please remember, it is not going to be as mushy as rice cooked in pressure cooker. I cook the rice plain, if needed, you can add salt to taste and little bit of oil. 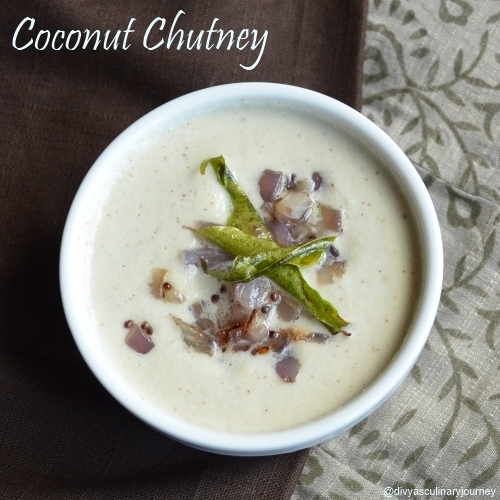 The best side dish for any South Indian tiffin items is Coconut Chutney. So it doesn't need much introduction. It is very simple, easy to make, and can be made in a jiffy. Grind together coconut, roasted gram, and green chillies in to fine paste adding required water. Heat oil in a pan, add mustard seeds, once they crack add chopped onions and curry leaves and saute till the onions turn golden brown. Add the ground paste to this and mix well. Adjust the consistency by adding required water, salt to taste. For a variation, in flavor, you can add 3 cloves of garlic while grinding or instead can use a small one inch ginger. 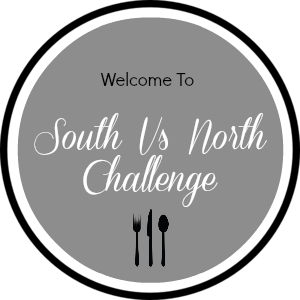 When Divya Pramil announced the South Vs North Challenge , I loved the concept and wanted to take part in it, so mailed her expressing my interest and got a reply from her, if I would be willing to challenge the North Team. I said, I would be glad to. 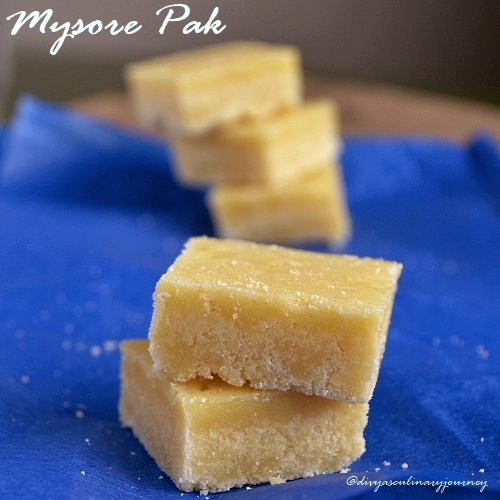 So here I am posting the challenge for the north team, "Mysore Pak", traditional south Indian dessert. 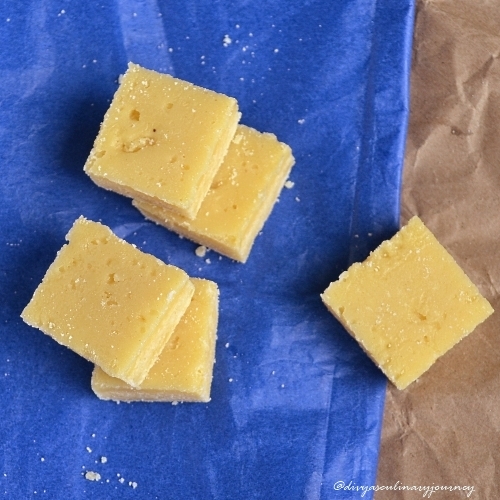 Coming to the recipe, Mysore Pak is a traditional South Indian dessert. 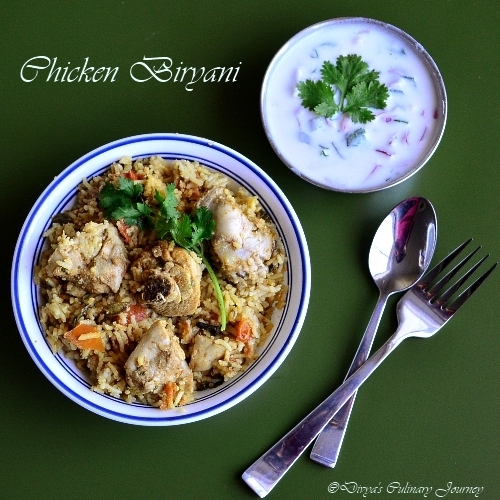 According to wikipedia, it was originated in the royal kitchens of Karnataka. 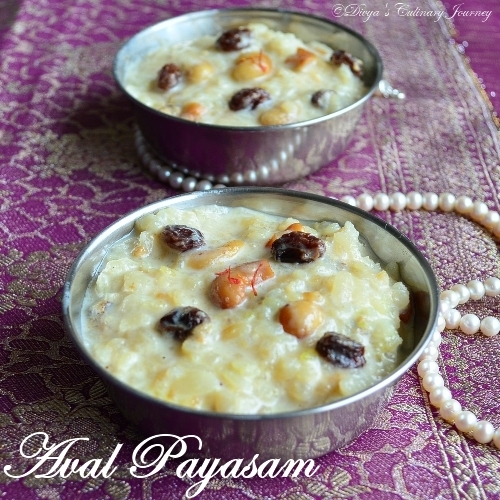 It is made of Ghee, Sugar and Gram flour. Usually all South Indians make it during Diwali. But am no expert in making it. So the person I turned on to for help is my neighbor, Geetha. She was kind enough to come home and make it for me. As she was making, I was clicking, so am able to give step wise pictures for you here. 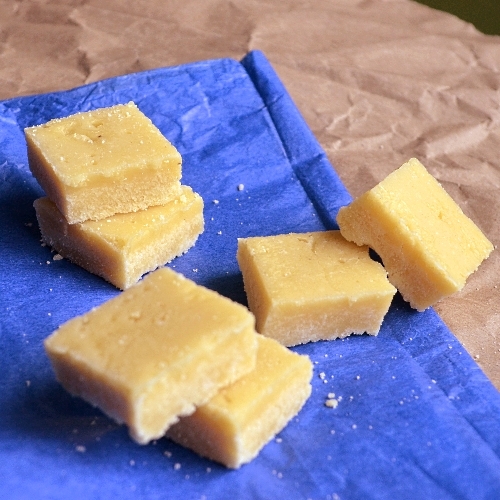 Prepare a tray by greasing it with ghee and keep it aside. 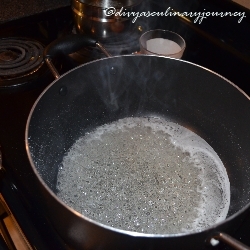 In a pan mix sugar and water, Boil them to get the required consistency of syrup. The required consistency is when you drop syrup in a bowl of water, it should stand without getting dissolved. 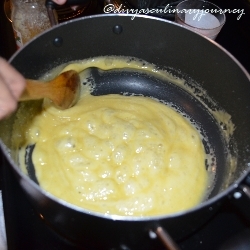 Then add the besan mixture to the syrup and keep stirring. You have to keep stirring till the mixture changes in texture and starts leaving the edges. There is light change in color too. Pour this into the prepared pan. It hardens immediately. Grease the knife with ghee and cut them to the desired shape. When it is still warm turn the plate and remove them. Use a non stick pan, for cooking it makes it easier. Consistency of sugar syrup is more important. Keep stirring, never take your hand away. 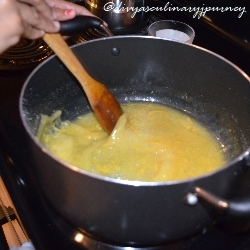 As stirring, keep adding the ghee with the other hand till you get the desired consistency, not necessary you have to add all the 1/2 cup though. so it is approximate measure. Prepare the pan ahead, as you wont have time later, once the required stage is reached immediately transfer to the pan. Slice it to required shape while it is still warm. Best of luck from me and the South Team.